Chuck Gast’s daily work commute consists of a half-mile walk to and from his home in Toledo, Ohio. It’s something he’s done since joining Yark Automotive Group in 2007. Gast never took it for granted, but he cherishes it more now after pleural mesothelioma took the simple pleasure away for an entire year. 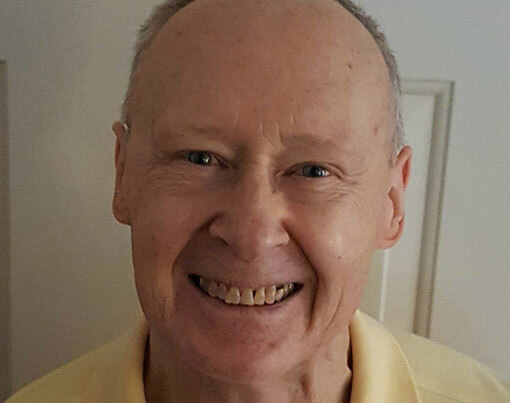 Gast, 71, received his mesothelioma diagnosis in July 2016 after experiencing shortness of breath and chest pain for a couple months. During an early checkup, doctors discovered his right lung was three-quarters filled with fluid. A pulmonologist told him it was likely just an infection. Unlike many mesothelioma patients, Gast was knowledgeable about the rare cancer at the time of his diagnosis. His former wife, Melva Warnock, was diagnosed just three years earlier. “When I was working in a plant for like six weeks during the summer for a temporary job, I brought the [asbestos] fibers home on my clothing and she would launder my clothes,” he said. After learning his diagnosis, Warnock was the first person Gast called. She provided him with all the legal and medical resources he needed. “I went through all the same ones, because she had already done the groundwork,” he said. Mesothelioma survivor Chuck Gast enjoys lifting weights in his spare time. Gast traveled north to Michigan for treatment at University Hospital in Ann Arbor, where he underwent pleurectomy/decortication (P/D), an aggressive surgery that aims to remove the lining of the lung — where pleural mesothelioma forms — and as much cancer growth from the chest cavity as possible. The surgery lasted nearly nine hours, but it was a much better alternative than an extrapleural pneumonectomy, which removes the entire cancerous lung. “When I was considering different treatments, [Warnock] said if doctors told me I had to get a lung removed to get a second opinion because she didn’t have to have hers removed,” Gast said. However, Warnock’s surgery a few years earlier didn’t go as smoothly. Her P/D procedure took 11 hours and she didn’t have the use of her right arm for a year and a half. She never returned to work. Gast spent two weeks recuperating from the P/D in Michigan before three weeks of rehab and physical therapy back in Toledo. For the first few weeks back in Ohio, Gast underwent four rounds of chemotherapy. The follow-up scan came back clear. Asbestos exposure is the overwhelming cause of mesothelioma. Most cases are linked to heavy, repeated exposures over the span of many years or decades. For Gast, it only took six weeks. He was an elementary school teacher for 16 years, but it was a summer job in 1973 that ultimately led to his cancer. Although many manufacturers and corporate executives knew of the dangers of asbestos in the 1970s, knowledge among the public and workers was low. Gast would pack insulation into the furnaces by hand. He would also cut asbestos bricks and use a mud trowel to adhere the bricks together. High concentrations of toxic asbestos fibers were in the air of the factory. Gast unknowingly brought the fibers home, exposing Warnock. Warnock’s mesothelioma diagnosis came 40 years later. Although her recovery was rockier compared to Gast, she is now driving again and recently took a vacation. One of Gast’s doctors at ProMedica Flower Hospital in Toledo told him it was extremely rare for two people in the same household to be diagnosed with mesothelioma. Three years later, when he began experiencing lung problems, Gast wasn’t even considering mesothelioma as the reason. Gast’s wife and stepdaughter were with him every step of the way through his treatment and recovery, as was his daughter from his previous marriage. His church family became a huge support system with constant visits and prayers. Many of Gast’s co-workers at Yark Automotive came to visit and give him their best. “Everyone has been just wonderful with all the support,” Gast said. Life now has essentially returned to normal. Outside of working, Gast stays busy by lifting weights, playing softball and cheering on the Detroit Tigers and Michigan Wolverines, attending games when he can. He continues to get scans and checkups at his home hospital in Toledo. His most recent CT scan revealed a tiny tumor on the lining of the lung. Doctors said it was too small to treat with surgery or chemotherapy, but nothing to be concerned with at this point. While Gast never imagined he or those close to him would end up battling this rare cancer, he considers himself stronger for the experience. He uses that same determination to live life to the fullest — something he is reminded of during that daily walk to and from work.